For those of you who like to try different cuisines while traveling, there is good news: Korean food is awesome, cheap (mostly), and plentiful. 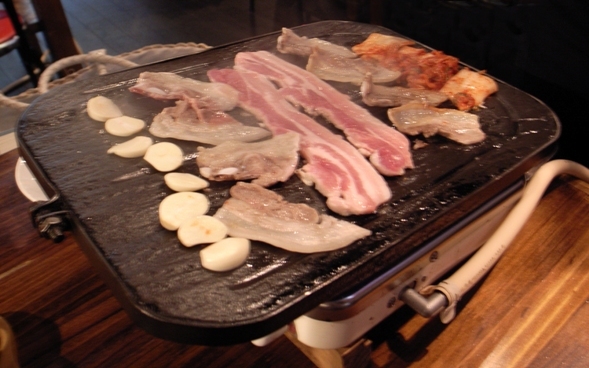 Korean food is not limited to the “Korean BBQ” that you find in Los Angeles, which is actually a Korean-American adaptation that Koreans call “LA Galbi.” Korean food includes soups, seafood, grilled meats, and much more. Here are five things you should definitely try if you find yourself in South Korea anytime soon. In this list, I have only included main dishes, but will make another list about snacks or side dishes soon. If I know some good places, I also suggested them after each entry, and put the name (often just a description) in English, Romanized Korean (how it sounds), and Korean characters (for you to point at when ordering) at the top of each entry. Kimbap is usually made with rice, radish, many vegetables, a strip of ham, and your chosen extra (in this case, tuna) wrapped around in a seaweed leaf. It is then rolled (like sushi) and cut into cylinder slices (like sushi). One roll is usually enough to fill you up as it has a lot of rice, but get two if you are really hungry, no one will think less of you. Kimbap comes in many forms including: vegetable, tuna, cheese, kimchi, and many others that are more unusual . Kimbap restaurants are the Korean equivalent of a fast food joint in America. You can see them anywhere in Korea, “Kimbap / 김밥,” in big neon signs. While most look appetizing, the tuna variety is by far the best. In fact, I don’t even remember the last time I had a non-tuna kimbap. 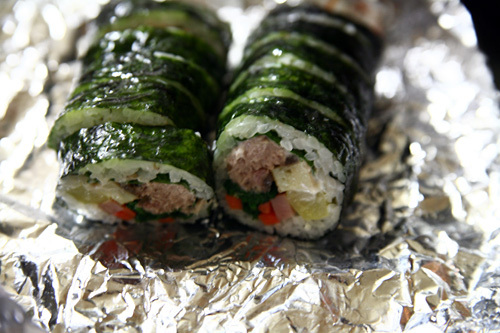 Kimbap is also one of those sensitive foods that if done wrong, tastes terrible. Don’t be disappointed if you get a bad one. At less than 3,000 Won (under $2.80 USD), it is worth trying again and again until you get a good one. This is another one of those meals that taste amazing if done right, or average at best if done wrong. 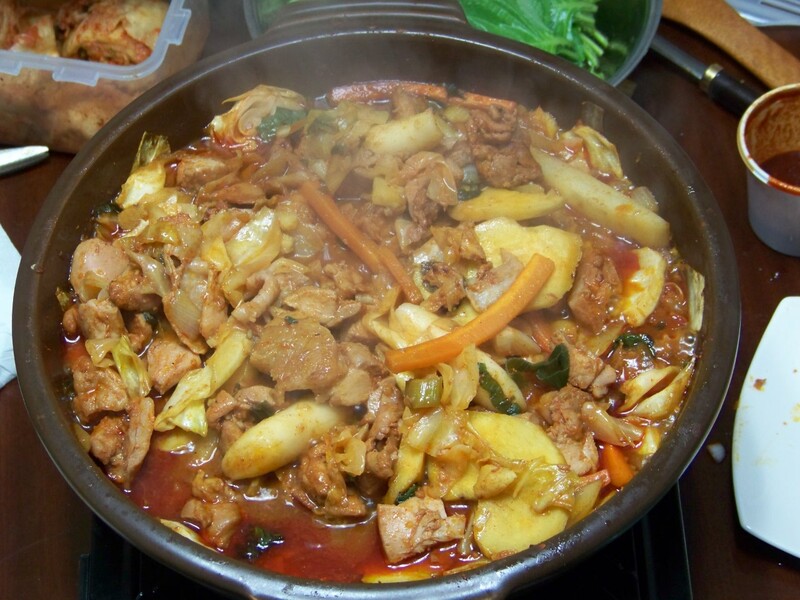 Jeyukdeopbap is a thin sliced pork marinated in a red or orange sauce with onions and a few other vegetables. It usually comes as a set of meat in its juices on one side, and a slab of rice on the other. When you mix the two, it tastes like a curry with a fantastic pork flavor. 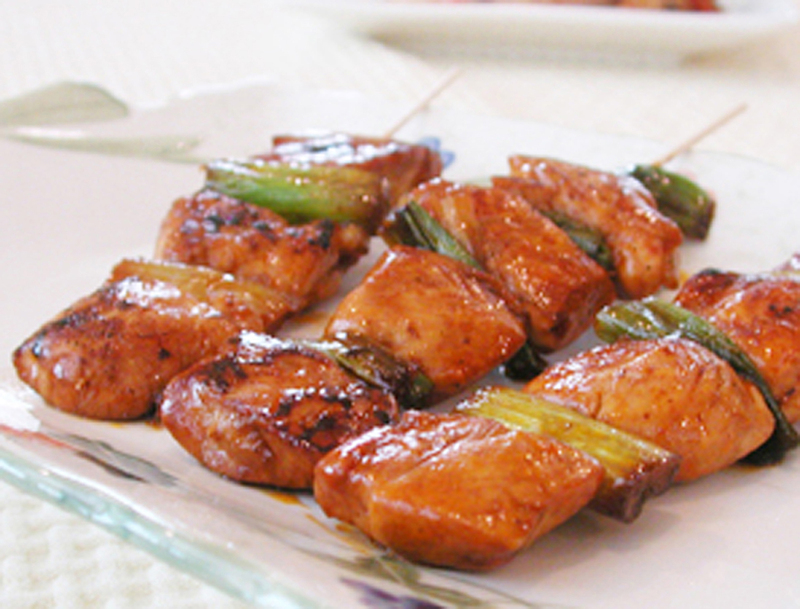 While it is not spicy, the sauce can be very flavorful and salty to give the whole meal a richer taste. 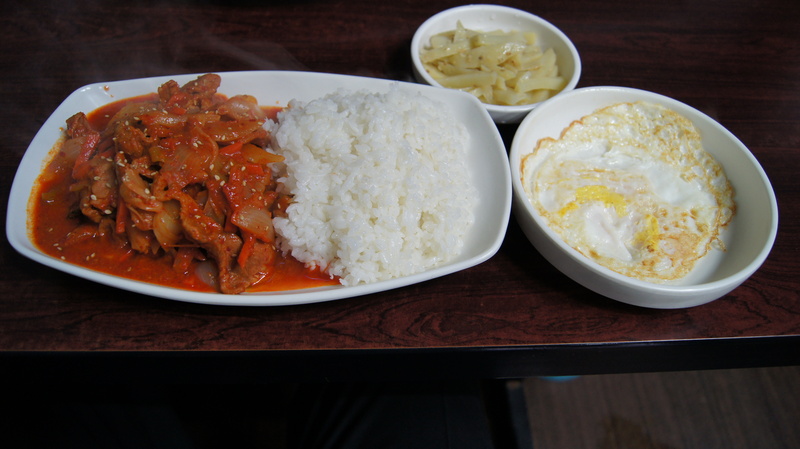 It is usually around 5000 Won ( $4.50 USD) at most restaurants and will definitely fill you up.